How Do I Remove Epoxy Grout Haze From Tile? There are different methods used to pour shower pans before ceramic tile installation. Today's tile installers usually mix up some ready-mix concrete, pour the shower floor and come back the next day to install the tile or stone. However, the old-school tile installers have a method where they set the shower floor and install the tile all in the same day. It is a matter of choice and depending on your skill set, but the latter method eliminates a step, saves time and makes more sense. Fill five five-gallon buckets with builder's sand and dump this on any concrete surface, making a mound. Add a little more than a half bag in the center of the mound. Mix the sand and Portland cement thoroughly using the square-point shovel. A good method for this is to transfer the whole pile from one spot to another until it is completely mixed. Fill a bucket with clean water. Take the sponge and sprinkle the sand mixture with water as you continue mixing the sand. Mix and continue adding water until the mixture is the consistency of brown sugar. You do not want it to be too wet. A good test is to squeeze the mixture in your hand. If it compacts and stays together, it should be about right. It should not take more than a full bucket of water. However, the amount of water will depend on the moisture content of the sand. Fill five-gallon buckets with the sand mixture and dump them into the shower pan, being careful not to get any in the drain. Use a notch trowel to spread, compact and form the mixture to the desired shape and slope of the shower floor. It is very important to compact the mixture so it will form a solid base for the flooring material. 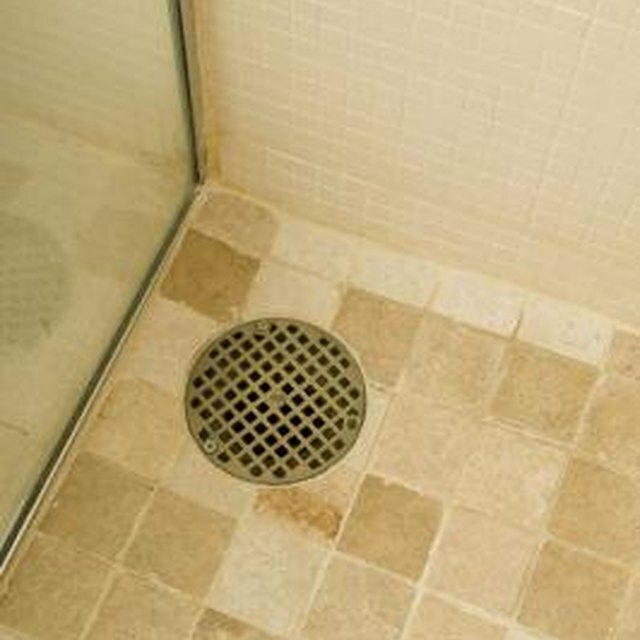 Sprinkle the unsanded thinset over the shower floor so that you have a layer about 1/4 inch thick. Coat the floor evenly until it is completely covered and no gray color shows through. Install the tile by laying it in the desired pattern onto the shower floor. Position the tile in as close a proximity to its desired position as you can. Adjusting the tile is okay, but try not to pick it up unless necessary. It will remove the unsanded thinset with it and applying more thinset will be necessary. Once the tile is in place, take the beating block and sink the tile into the shower floor until it is flush. Do not forget to adjust the drain as necessary. Apply at least a half bucket of water on top of the installed tile. Use the sponge to disperse the water. Appling the water is crucial; do not be shy, cover the entire floor thoroughly. The shower floor is ready to grout the following day. How do I Waterproof an Existing Leaky Shower Floor?